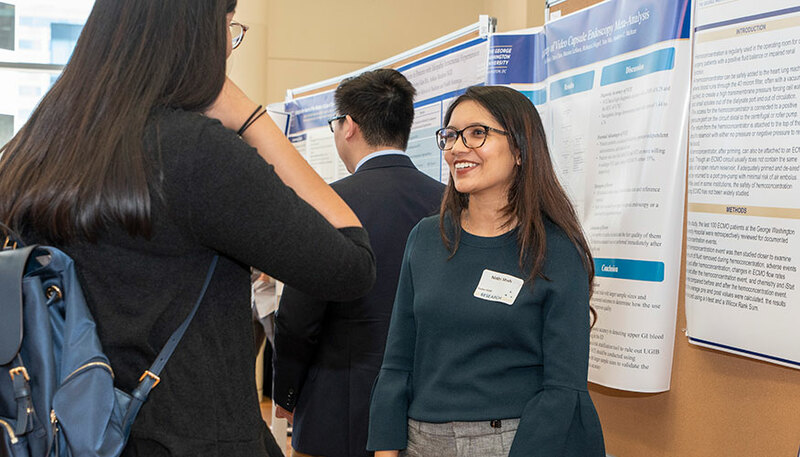 Knowing that the research you are working on in the lab may one day directly help patients is really gratifying, said Marcia Kraft, MD, to the Lisner Auditorium audience gathered to celebrate Research Days at the George Washington University (GW). Medical and health sciences students, along with postdoctoral fellows, students in the Institute for Biomedical Sciences (IBS), and those from the GW School of Nursing and the Milken Institute School of Public Health at GW (Milken Institute SPH), participated in day two of the 24th Annual GW Research Days, which focused on research in medicine and health, on April 10. Kraft, who serves as the Robert and Irene Flinn Professor of Medicine and chair of the Department of Medicine at the University of Arizona College of Medicine in Tucson, focused her keynote address on the research that she and her team are doing on innate immunity in asthma. The Milken Institute SPH welcomed Anselm Hennis, MD, MSc, PhD, director of the Department of Noncommunicable Diseases and Mental Health at the Pan American Health Organization/World Health Organization, to deliver the keynote address to public health students. To see the full list of awardees from both days, visit www.researchdays.gwu.edu.